The Summer holidays are finally here, and with six weeks of freedom rolling in front of you, it’s the perfect time to get crafty! Here at DYLON dyes, we have an array of beautiful colours that will inspire you to transform your wardrobe. Easy and fun to use, why don’t you have a go dip-dyeing some jeans for Summer? It’s the on trend look that you can get for the price of a packet of dye…Sorted! Wash your white jeans, leave damp. Hang up somewhere safe with your coat hanger. Fill your large bucket or sink with 6 litres of warm water, and then add the salt. Stir. It’s dyeing time! For the dip-dye effect, submerge the bottom section of your jeans into the dye. Leave for 15 minutes. Next slowly edge your jeans further into the mixture, leaving for 7 minutes. Continue to do this, gently submerging your jeans into the mixture for less and less time. This will ultimately create a fab dip-dye effect! Go as far as you want to go, we recommend half way! Once you’ve finished your dyeing, remove from the dye VERY CAREFULLY. Rinse your jeans under cold water until the water runs clear. Give the jeans a quick wash with detergent , and hang out to dry. Rock your new amazing dip-dye jeans with pride! And voila! 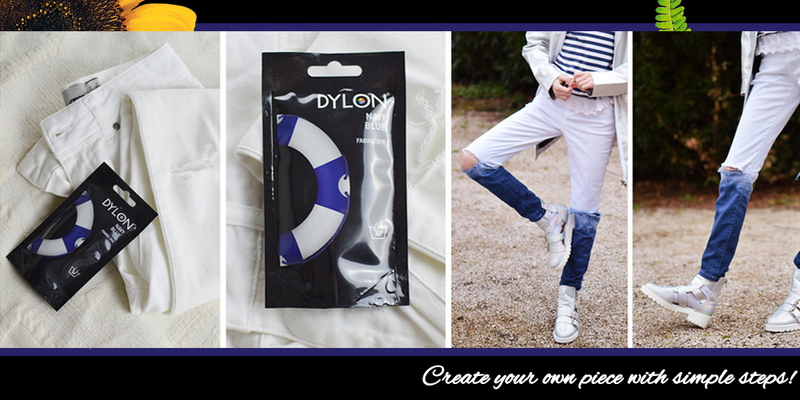 You’ve got a brand new, super unique pair of jeans – customised by you! Remember, this can be achieved with any of our colours, so pick your colour with DYLON today!